COME RUN WITH THE LONGHORNS - June 2nd, 2019! Join us for our 5th Annual Longhorn Stampede Run/Walk - a 5K, USATF Certified event through the Cambrian neighborhood. Whether you are a walker, casual jogger or a distance runner, come join your community at 9am, on June 2nd, 2019. This 5K Run/Walk is a great opportunity for kids, families, friends and businesses to come together and build a strong and healthy community. Special family pricing available. Runners and walkers are invited to come in costume! Prizes will be awarded (details below). Else Singsigalli, a Certified Personal Trainer from the Jewish Community Center in Los Gatos, will present a dynamic, full-body warm-up prior to race start. The route starts outside Leigh High School, and ends in the school quad. Our Leigh cheerleaders and band members will be on the course providing spirit and music! There is plenty of parking and there will be snacks, drinks and fun activities for everyone at the end. If you are not walking or running, come out and cheer on the participants! All booster clubs at Leigh, including Home & School Club, Performing Arts Parent Association, Sports Boosters, and Spirit Boosters have joined forces to put together this fun filled 5k neighborhood Run/Walk. Proceeds will benefit all Leigh students. Sign up now! Prices go up on race day, and race T-shirts are only guaranteed for those who register before end of Wednesday, May 12th, 2019. USATF Certified: For those more serious runners, the course is USATF Certified. This means your road running performance can be accepted as a record or be nationally ranked. Runner/Walker 20 years and older. Please sign up all family members at once. Max of 5 members, 2 adults max. Teams can be created and joined at Registration time. Each Team must have a minimum of 4 runners (there is no maximum). A minimum of 4 runners must cross the finish line to score, and only the first 4 runners score. Team awards will be given to the top 3 teams. There are no age brackets for the Team race. * T-Shirts: Only registrations on or before Wednesday, May 12th are guaranteed a T-shirt. No discounts if T-shirt supply has run out after this date. Registration will be available at packet pickup, and on Race day. Do you own a business? Please consider sponsoring the Stampede! Click below for more info. 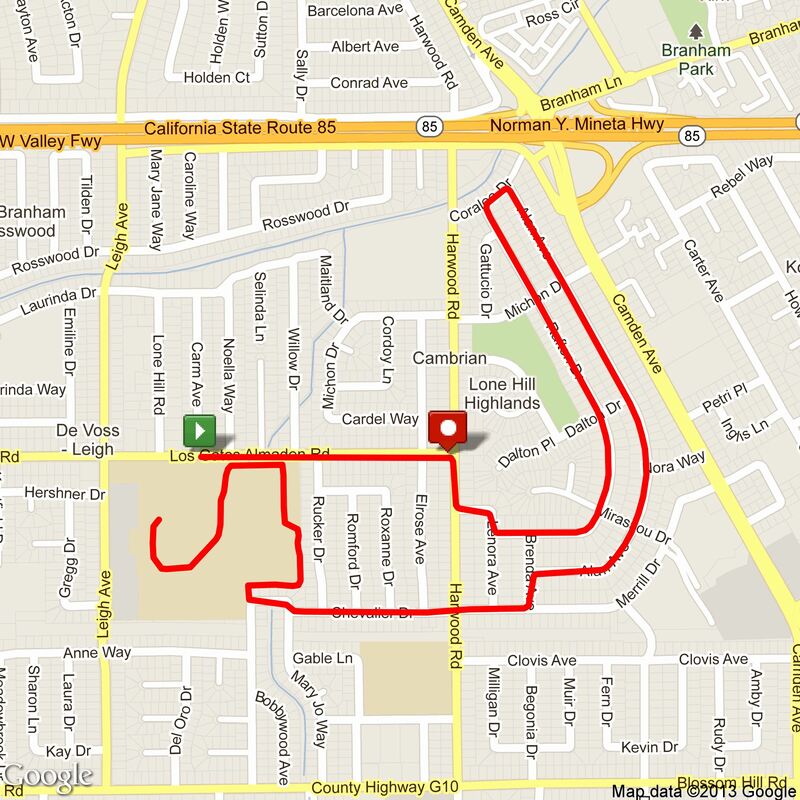 To see a larger view of the course map, please right click and open in a new tab.